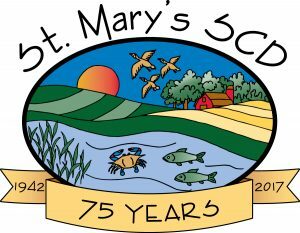 St. Mary’s SCD’s mission is to promote practical and effective soil, water, and related natural resource programs and to provide assistance to all citizens on a voluntary basis through leadership, education, and cooperation. The St. Mary’s Soil Conservation District is a political subunit of state government which was created on November 14, 1941. The legal charter was issued by the state of Maryland on January 5, 1942. The District is governed by a board of supervisors who are local county residents. Members are appointed to five (5) year terms by the State Soil Conservation Committee, with recommendations from the County Commissioners, Farm Bureau, and University of Maryland Extension. There are five voting members, one non-voting member and associate members. These supervisors regularly attend meetings to keep informed on local, state and national issues, which could have an impact on farmers, landowners and residents within our area. The District’s technical staff is provided by the USDA, Natural Resources Conservation Service, the Maryland Department of Agriculture and from the District itself. New Manure Spreader Has Arrived! St. Mary's Soil Conservation District, 26737 Radio Station Way, Suite B, Leonardtown, Maryland 20650 - phone 301.475.8402 ext. 3, fax 301.475.8391 Non-Discrimination Statement Copyright © 2019 . All Rights Reserved.